Dental implants are used in the dental industry as a root device to support dental restorations. Commonly constructed out of titanium, these implants resemble either a tooth or even groups of teeth and replace teeth that have been knocked out. 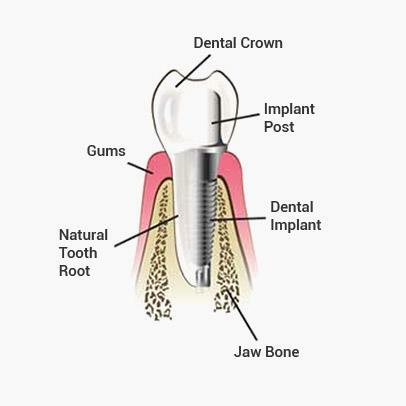 Root-form endosseous implants make up the majority of these kinds of implants that are used today. Surgery for dental implants can be performed under local anaesthesia, general anaesthesia, intravenous sedation, nitrous oxide sedation or oral conscious sedation by dentists, prosthodontists, periodontists or oral surgeons. Dental implants look quite similar to a real tooth and consequently, are positioned within the bone. The jaw’s bone receives and then osseointegrates with its titanium post. Osseointegration is a term for the fusion of the jaws surrounding bone with the implant’s surface. Patients have to remember that even though dental implants do fuse with the jaw’s bone, they do not have periodontal ligament. As a result, said implants will feel somewhat different from real teeth when patients chew food. Many dental prostheses can be supported by way of these implants. Some dental prostheses that can be supported by these implants are crowns, dentures and implant-supported bridges. They might even be utilised as anchorage in orthodontic tooth movement. These cheap dental implants allow unidirectional tooth movement minus any reciprocal action. The success of these implants is based upon these four distinct factors. According to consensus estimates, the success rate for these cheap dental implants is at a high rate of 95 percent.